Last Updated 1 year ago. Click "Updates" above to see the latest. Lego Ideas is where people show ideas for Lego models with a chance to become an official Lego set. Please press the blue SUPPORT button to vote! The button will change to 'SUPPORTING' when successful. Voting is not a commitment to purchase any LEGO product. -Getting scientists with a large online following to Tweet or Facebook about it. ITER is a fusion reactor. Fusion is what powers the sun and stars. ITER has the potential to provide clean, abundant energy. It amazes me to think we can harness this power source on Earth. I enjoy science and pushing the limits of knowledge. These things and a love of Lego inspired me to make a model of ITER. My Lego Ldd model segment has 498 parts including two micro figures for a sense of scale and detail. I have added color to visually separate the different elements. I plan to build the model using Lego. Some parts such as the control console near the micro figure can use existing Lego parts that have details printed on them, such as dials, and vents. On the base there is a card holder Lego part, which will have the name of the object (ITER) what it stands for and a few basic facts. When I buy the parts I will try out using a few different existing Lego printed parts, mainly for the console, near the mini figure. * This is not an official ITER Organization product. The ITER logo is used here by courtesy of the ITER Organization. 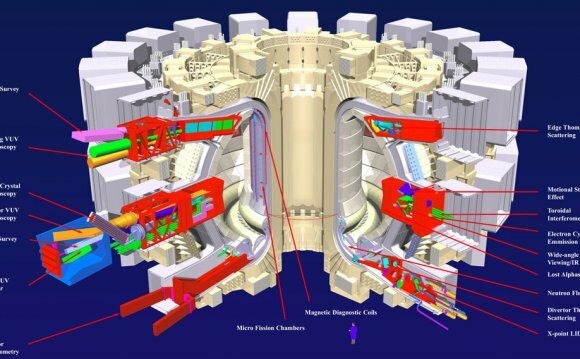 France’s Iter Fusion Reactor Interest a Critical Phase’.